Love for the game: Apollo Perelini passes on his knowledge at 7he Sevens. UAE Shaheen coach Apollo Perelini believes Emiratis becoming truly passionate about rugby is the key to the progression of the game in the country. The New Zealand-born former dual code Samoan international was named head coach of the development team last month and took charge of his first training session at 7he Sevens last night. rugby being introduced for the 2015-16 season. The Shaheen begin their campaign on September 18 against Jebel Ali Dragons 3rds and Perelini is aiming to win the competition. “My plan is to do really well in that third league. I’m aiming to win it. I want to win it,” said Perelini, who burst on to the world stage with Western Samoa at the 1991 Rugby World Cup. 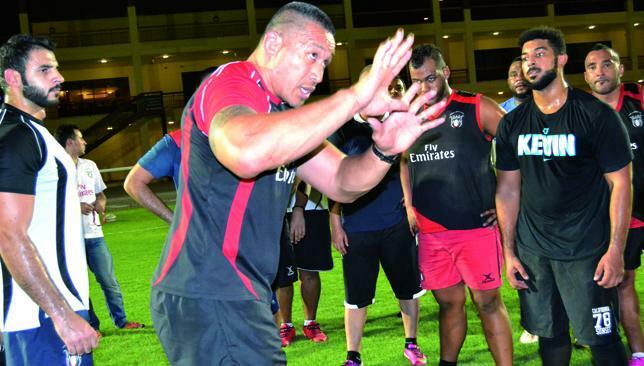 The 45-year-old stressed his appointment is part of a long-term plan aimed at teaching local players how to compete and instilling rugby into the Emirati culture. “The key is to try and get some of these guys playing in the UAE national team one day,” added Perelini. “It’s not a quick fix. It’s a big project. “Expats come and go but these guys are the mainstay, they’ll be here in the long run. “We grew up on it, it’s second nature. These guys have had to learn it. My aim is for kids from age five to learn and understand rugby before they get to a competitive age. “If they learn it from a young age they’ll grow a passion for it. I want these guys to grow a passion for it and they will rub off on the next generation. Coach Apollo bringing it back to basics tonight for the first UAE Shaheen training! The Kiwi enjoyed a glittering rugby career in the UK, initially in league with St Helens before crossing over to union with Sale Sharks. He said he was hugely encouraged by his side’s first gathering, with the team now set for three gruelling two-hour training sessions per week for the next four weeks in order to be ready for the first game of the season. “There’s a lot of potential there. It was really good and I was really impressed with some of the boys,” said Perelini. “I’m hard and strict on the skills of the game but also very approachable and like to have fun and train with a smile. If they train with a smile, they’ll want to be here. The UAE were well beaten in Hong Kong. 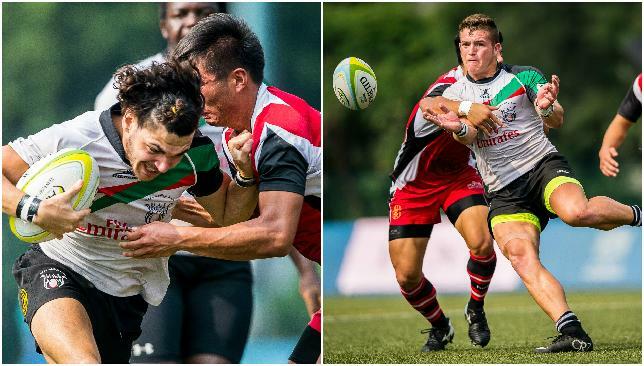 The UAE’s participation in the U20 Asia Rugby Asian Sevens Series ended on a sour note Saturday as they suffered three straight defeats in Hong Kong. Roelof Kotze’s men were beaten 24-21 in their final game against Kazakhstan, meaning they finished last of the eight teams competing in the second leg of the Series. The UAE youngsters were hammered by hosts Hong Kong 41-7 in the quarter-finals, following that up with a 21-12 defeat to Thailand. Not our best day! Lost all 3 games! Back Home to start again! Seniors in China next month! The Kazakhstan result made it five straight defeats for the UAE since they opened the second leg so promisingly by beating Sri Lanka on Friday. “Obviously it’s a massive disappointment knowing that we had the potential to do very well,” said UAE skipper Adel Al Hendi, 20. “I still stand by what I said, that the team came together very well, and we showed that when we played last week’s semi finalists Sri Lanka. After their perfect start to proceedings, the UAE had given themselves an uphill task, defeats to Malaysia and China seeing them finish bottom of Pool B to set up a clash with Pool A winners Hong Kong. The tournament hosts scored seven tries in their unanimous victory, Kenyan powerhouse Kip Chirchir the sole man to cross for the UAE. Hong Kong went on to hammer Malaysia 52-7 in the Cup final to record back-to-back leg wins. Defeat sent the UAE into the Plate semi-finals, Al Ain Amblers duo Jeremaia Kilicanasau and Tomasi Tirkikula scoring tries as they were downed by Thailand. At the previous week’s first leg in Malaysia, the UAE at least had the comfort of beating Kazakhstan in the seventh-eighth place play-off. Here they could not even fall back on that, the Kazakh’s triumphing four tries to three. Devante Steele, Kilicanasau and Majid Al Balooshi crossed for Kotze’s men. Try-scorer Chirchir, 17, a real positive during the two legs for the UAE with a total haul of seven tries, felt he and his colleagues could have performed far better. “We are completely gutted, especially since we lost to a team that we had already beaten twice before,” he said. “We were off to a bad start losing against Hong Kong at the start of day though the vibes remained positive and we managed to put on a great performance against Thailand although it wasnt enough. Iziq Foa’i also thought the UAE are a lot better than they showed in Hong Kong. UAE captain Al Hendi (2nd l) was "gutted" by the performance. The UAE limped to seventh place in the first-leg of the Asia Rugby Under-20 Sevens Series in Malaysia on Sunday, winning just two of their six matches all weekend – both against Kazakhstan. Their dreams of a podium finish were dashed in the very first game of the final day, Roelof Kotze’s charges taking the lead against Sri Lanka, before the eventual tournament runners-up stormed back to win convincingly, 33-7. The UAE youngsters then lost 26-7 in the second tier Plate semi-final against Thailand, before signing off with a 22-15 win against Kazakhstan to claim seventh place. Ended on an up! Beat Kazakhstan for 7th place finish! Planned for top 4, not what we wanted! Hard work this week! Hong Kong next week! Fijian Jeremaia Kilicanasau got the UAE off to a perfect start in Johor on the second day, the diminutive Al Ain Amblers man going over for a try before Devante Steele’s conversion gave Kotze’s men a 7-0 lead. However, that was as good as it got for the men from the Emirates, Buddima Kudachchige, Joseph Dixon, Nishon Perera, Sithum Peiris and Prinse Ravisinghe responding to comfortably send the Sri Lankans through to the semi-finals. Thailand had lost all four games and finished bottom of Pool A prior to meeting the UAE in the Plate semi, but surged to victory by four tries to one. Steele crossed for the UAE and converted his own try, but a Peerapol Chukoun brace and tries from Wuttipong Sakulthianthong and Yordsakon Watcharakongsak saw Thailand through to the Plate final, which they won by beating Singapore 22-5. The weekend at least ended on a high for the UAE as they enjoyed a four tries to three victory over Kazakhstan, who they beat in the pool stages on Friday. Kilicanasau was on the scoresheet again, so too Kip Chirchir, who added to his hat-trick against Singapore on Saturday. Tuharangi Kahuranui and Tomasi Tirikula also scored, the latter right at the death to seal the win and put a gloss on the tournament for the UAE. “We showed that we were very good with possession against Sri Lanka and scored the first try,” added skipper Al Hendi. “There wasn’t much they could do to defend but we gave away silly mistakes and once they had the ball they were too fast and our defensive line wasn’t pushing them hard enough to close them down. Despite the setback, the 20-year-old Abu Dhabi Harlequins’ winger remains upbeat ahead of the Series’ second-leg in Hong Kong next weekend.